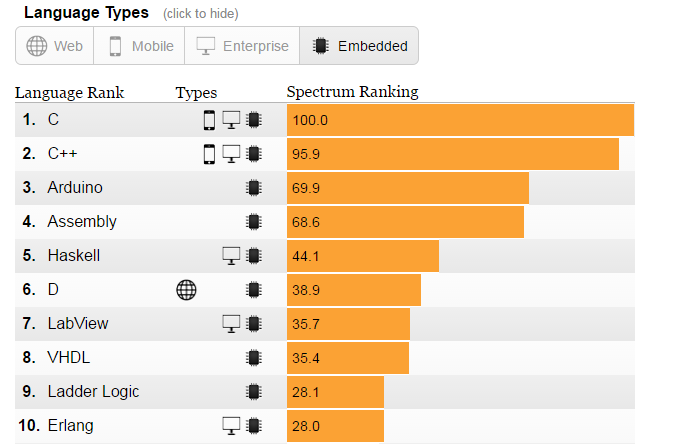 LabVIEW is on the 7th place among programming languages for Embedded! This news is a bit old, but anyway, since summer, when the rank was published by IEEE Spectrum, LabVIEW moved from 8th to 7th place. The rank contains list of the most popular programming languages for Web, Mobile, Enterprise and Embedded sectors in 2016. It is created by weighting and combining of 12 different metrics, and 10 various sources. The key point is that this rank is not built on some surveys among programmers – instead is used analysis from specialized web-resources, social networks, etc. The original rank you can check by this link. So, what do we have? Of course, the ultimate leader is C and after it, with minimum difference, C++. And this is expectable, of course. And, it’s very nice to see LabVIEW on the 7th place – although it’s too close to D and VHDL. 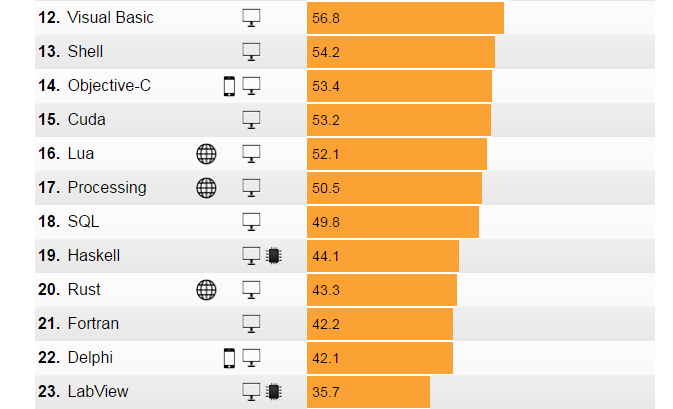 And, moreover, LabVIEW is marked as language for Enterprise sector – but in that rank, it takes 23rd place. Not bad, but the main point is not the rank, but real popularity based on job offers – because you can program on whatever you want, but you need to sell your products. And from this point of view, unfortunately, LabVIEW is still on low positions. But let’s believe in better! Author wants to appreciate website cnx-software.com, which original article was used as the base for this post. ← LabVIEW queued state machine: enum or string?